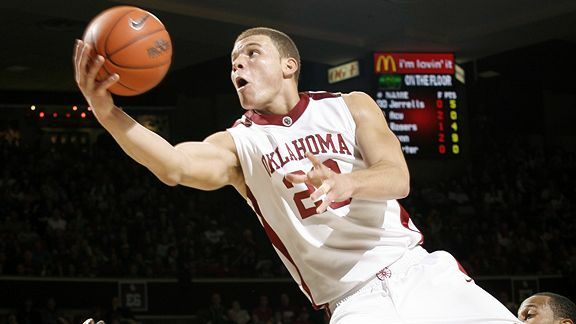 Former Sooner Blake Griffin has been accused of slapping a 39-year-old man inside a nightclub in Vegas this weekend ... TMZ Sports has learned. Here's what we know ... a man named Daniel says he was partying at Tao nightclub in the Venetian in the early hours of October 19th when he tried to take a cell phone pic of the crowd. According to a statement Daniel gave to Tao security, the man says Blake (who was partying at the club with his L.A. Clippers teammates) was bothered by the flash of the camera -- and "grabbed my phone with one hand." Daniel says he didn't let go of the phone because his ID and credit card were attached to it -- so Blake grabbed his neck and began to squeeze while demanding Daniel give up his phone "or else." According to the statement, the two eventually separated after Blake took the phone -- and when Daniel tried to ask for it back, Blake struck again ... grabbing his neck and squeezing for a second time. Daniel says when security finally got to the scene -- Blake told them, "Get him the f**k out of this club."